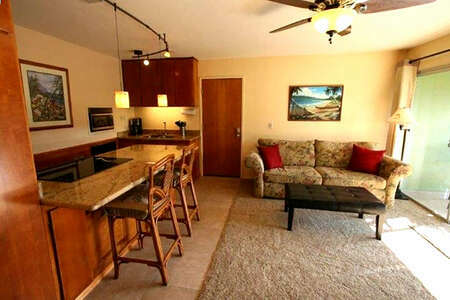 BEACHFRONT AT ITS BEST! 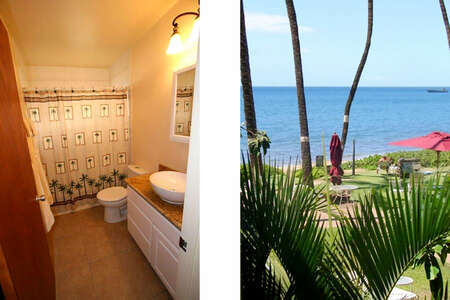 This renovated one bedroom, Partial Ocean view condominium nests on Sugar Beach on the sunny side of Maui! Sugar Beach at four miles long borders reserve and turtle nesting areas. 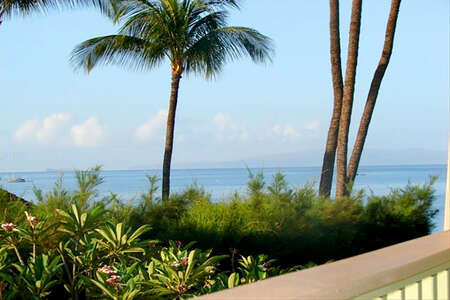 It is a wonderful beach for romantic walks and mellow for swimming and snorkeling. Colorful fish and sea turtles populate the reef. 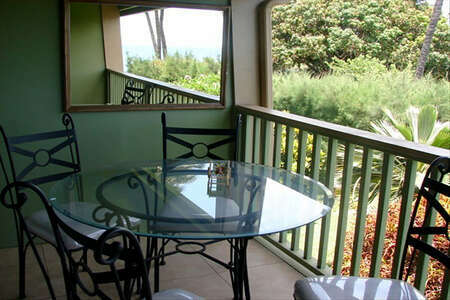 Kihei Kai is a friendly boutique complex on a quiet cul-de-sac. 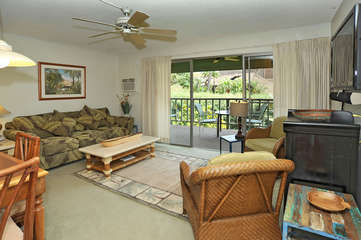 The swimming pool is tiled and tropical landscaping includes many fragrant fruits and shrubs. A lovely beachfront grassy area includes grills, dining tables and recliners which are ideal for viewing spectacular sunsets and star gazing. In the winter and early spring, you can watch whales frolic to your heart’s content! The tiled lanai, kitchen and bath and high quality carpet create comfort and ease. 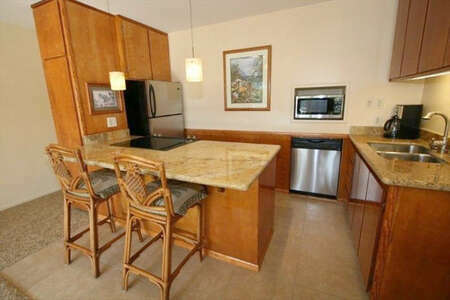 The condo is also updated with Medeira Gold granite counter tops. The fully equipped kitchen features stainless steel appliances, an under-mount sink, glass top range, dishwasher & microwave. 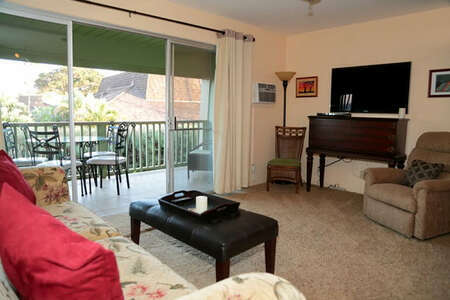 A Tommy Bahama secretary desk and 46" flat screen TV enhance the living room. 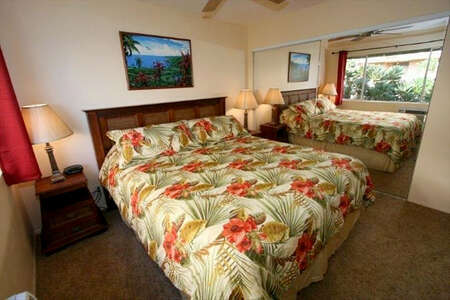 There is a beautiful ocean view cal king bedroom set. With refreshing trade breezes you may rarely need it, yet there is AC in both the bedroom and living room. The safe secures valuables and laptops. 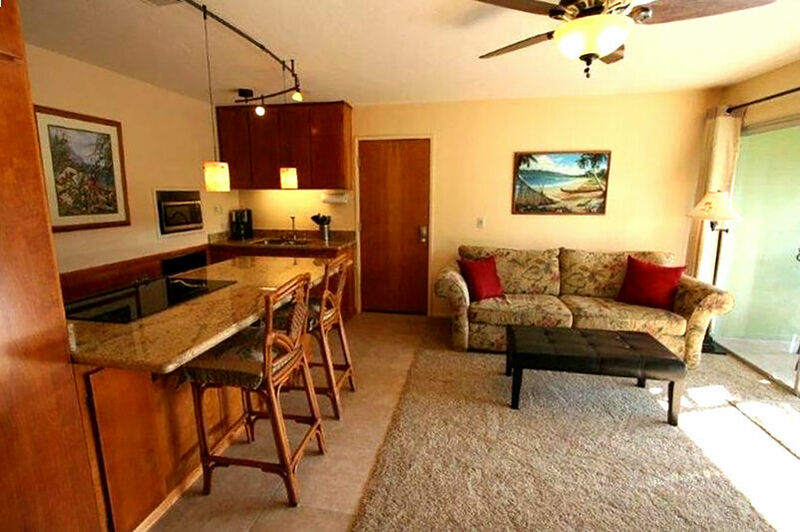 Condo #12 is part of the On-Site Kihei Kai Management at your service.